Ray Bean was born on September 1, 1943 in Alexander City, Alabama. He entered Officer Training School on August 18, 1967, and was commissioned a 2d Lt in the U.S. Air Force at Lackland AFB, Texas, on November 17, 1967. 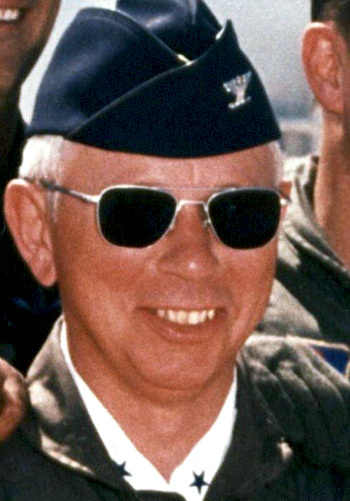 Lt Bean next attended pilot training from December 1967 to June 1968, and then transferred to Undergraduate Navigator Training, earning his navigator wings at Mather AFB, California, in September 1969. He then completed F-4 Phantom II Weapon Systems Officer (WSO) Combat Crew Training before serving as an F-4 WSO with the 8th Tactical Fighter Squadron at Holloman AFB, New Mexico, from March 1970 to July 1971. His next assignment was as an F-4 WSO with the 435th Tactical Fighter Squadron at Ubon Royal Thai AFB, Thailand, from July 1971 until he was forced to eject over North Vietnam and was taken as a Prisoner of War on May 23, 1972. After spending 310 days in captivity, Capt Bean was released during Operation Homecoming on March 28, 1973. He was briefly hospitalized to recover from his injuries at Sheppard AFB, Texas, and then served as a Test Project Officer with the 4485th Test Wing at Eglin AFB, Florida, from August 1973 to March 1974. Maj Bean next completed Undergraduate Pilot Training in May 1975, followed by F-4 Combat Crew Training from May 1975 to April 1976. He served as an F-4 pilot with the 91st Tactical Fighter Squadron at RAF Bentwaters, England, from May 1976 to December 1978, and then attended Armed Forces Staff College at Norfolk, Virginia, from December 1978 to June 1979. After completed Pilot Instructor Training, LtCol Bean served as an instructor pilot, Operations Officer, and later as Commander of the 90th Flying Training Squadron of the 80th Flying Training Wing at Sheppard AFB, Texas, from July 1979 to May 1983. His next assignment was as Chief of the Offensive Air Operations Branch with Headquarters Allied Forces Northern Europe in Kolsas, Norway, from May 1983 to July 1986, followed by service as a NATO Instructor at Fort McNair, Washington, D.C., from July 1986 to June 1988. Col Bean served as Assistant Deputy Commander for Operations and then as Deputy Commander for Operations of the 71st Flying Training Wing at Vance AFB, Oklahoma, from June 1988 to June 1990, and then as Commander of the 64th Air Base Group and Commander of the 64th Support Group of the 64th Flying Training Wing at Reese AFB, Texas, from June 1990 to July 1991. His final assignment was as a Professor in the Department of Strategy, Doctrine, and Air Power with Air War College at Maxwell AFB, Alabama, from July 1991 until his retirement from the Air Force on October 1, 1997. Ray Bean died on January 19, 2014. Captain William R. Bean, Jr., distinguished himself by extraordinary achievement while participating in aerial flight as an F-4D Weapon Systems Officer in Southeast Asia on 6 May 1972. On that date, despite adverse weather conditions and extensive air defenses while flying as a night Forward Air Controller, Captain Bean located a large number of vehicles carrying military supplies for use by hostile forces. With complete disregard for his own personal safety and exhibiting superior airmanship, he was able to destroy these vital supplies thus significantly hindering the resupply of the invading hostile forces. The professional competence, aerial skill, and devotion to duty displayed by Captain Bean reflect great credit upon himself and the United States Air Force.